Google launched the updated version of Google Keyboard for Android, now called Gboard, recently introducing new features such as search directly from within the keyboard interface. I'm not a huge fan of the new functionality as I don't require it at all. Unfortunately, there is no option to disable it completely in the application's settings. While browsing through the preferences the app makes available, I noticed quite a few that are privacy related. It was quite disturbing to realize that many of them were enabled by default, submitting data to Google in the process when the keyboard app is used on the Android device. This privacy guide for Gboard was born out of this. To get started, open any chat app on your device, e.g. WhatsApp, start a chat with someone, and tap on the G-button that the keyboard displays now when the keyboard is opened. Select the preferences icon then to open the Gboard settings. The main privacy settings that the app provides are found under Text Correction, Search, and Advanced. Tap on Text Correction first. You find automated text correction and suggestion options there for the most part. For instance, you may enable or disable the showing of suggestions while you type, or the blocking of offensive words. Personalized suggestions is enabled by default. Gboard "learns" from other Google apps and services, to improve suggestions. Search displays only two options. One to hide the G-button (but not to remove it completely), anothe for predictive search. This feature analyses what you type while you do so to suggest matching Google Search queries. What this does is send anything you type to Google Search for processing. Most privacy related options are found under advanced. There you find that the sharing of usage statistics and the sharing of snippets is enabled by default. 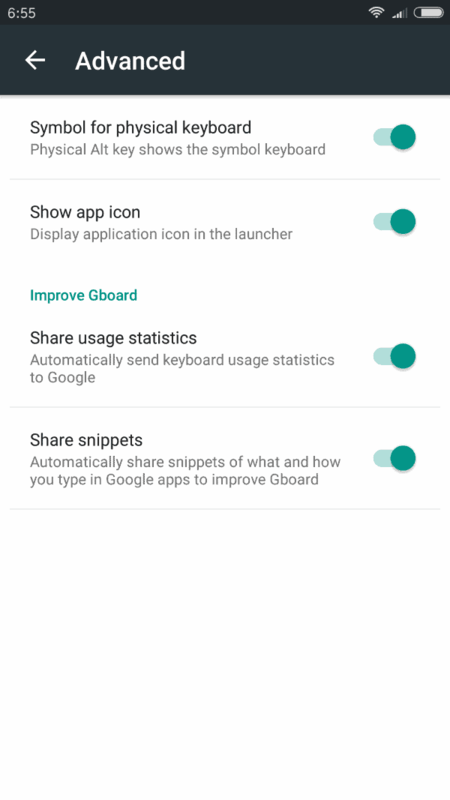 Share usage statistics sends keyboard usage statistics to Google automatically. Share snippets on the other hand what and how you type in Google apps to Google. If you use Gboard with suggestions, you may have noticed that there is no option to delete suggestions either completely or individually. You can clear the data of the application in the Android settings, but that removes all custom settings and customization from the app. I dislike the extra line the G-Button or >-Button take when you use the keyboard. Since I have no use for search or suggestions, I decided to install a different keyboard instead on my Android device. My choice fell on Hacker's Keyboard, a free keyboard app for Android that requires no extra permissions. Now You: Which keyboard app do you use? 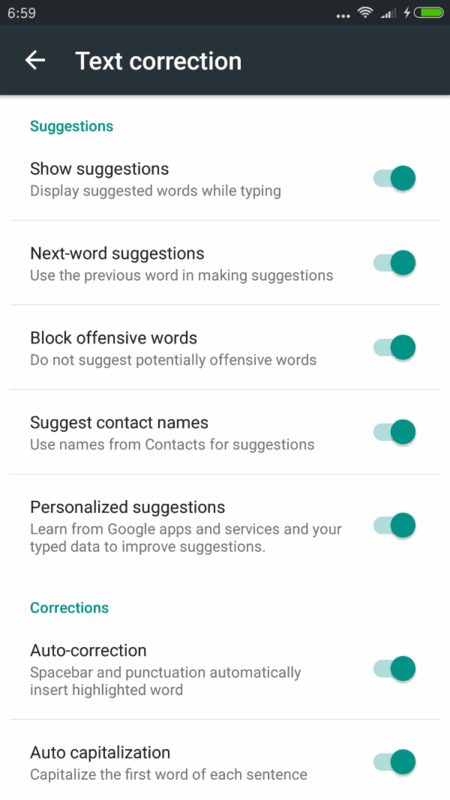 This privacy guide for Google Keyboard (Gboard) for Android explains core privacy-related settings of the app that you need to be aware of. logged in. They say no data is sent but I don’t trust that. Will try Hacker’s Keyboard, thanks. @Crodol: I use Swiftkey too. In my phone’s firewall, I simply blocked all internet access for Swiftkey (both incoming and outgoing data). So the keyboard software “thinks” that this phone has no internet access. Of course it still works fine that way! If you have no firewall on your unrooted phone, I recommend installing NoRoot Firewall, an app that works by simulating (locally) a VPN. This will allow you to block not just internet access for specific apps such as Swiftkey, but also – just like a regular firewall – to block specific addresses or domains systemwide: for example, you could also use it to prevent any app to connect with Facebook servers. Needless to say, I would never use a keyboard offered by Google. My Android rule-of-thumb is to avoid all Google apps as much as possible, even though they cannot always be avoided. Back in the day, when whatever you typed on your keyboard was sent to a third-party without your knowledge, you had a keylogger. Keyloggers are a common type of malware, not tolerated by antivirus products. If you don’t notice that Gboard is sending Google all that you type by default, you have malware, but it’s okay because the company making it is known and wraps everything in shiny tools that can be useful. The guide i didn’t need, as i turned off all the stuff anyway already. But it seems that also Martin didn’t find any option to turn off that frickn Toolbar. Did anyone figure out how to do so? For me that is just a major “bug”, or rather oversight on Googles Part. I do like the option to have a left hand mode, but i don’t understand why there is so much space wasted on the top and bottom. Will take a look at the keyboard proposed, thanks for the tipp. As there is no Swiss Keyboard, i hope the german one has äöü too. Just did a review of it, and yes it has Umlaut-support. Once again I had already made the same choice as Martin: Hacker’s Keyboard. I used it for several years and never found a better one. When I got my first Android tablet I must have tried out twenty or more options. I was looking for a decent set of arrows – keys that move the cursor up, down, left, right – because now my screen was so small and navigation by fingertip really worsened my already clumsy keying. I only switched away from Hacker’s when I acquired a physical keyboard for the tablet, a Bluetooth wireless accessory (also chosen for its respectable set of dedicated cursor navigation keys). With this, an onscreen keyboard becomes an interference; in my case, no settings reconfiguration alone cleared it up. The fix? A ‘blank’ keyboard app that acts as a placeholder for touchscreen keying. It’s Null Keyboard, by developer wParam. It replaces touch-keying of text; no virtual keyboard appears any more. Other screen touches, e.g. clicking a ‘Submit’ button, still operate though. There are others similar to Null Keyboard but I haven’t tried them. Another FOSS keyboard I would suggest is AnySoftKeyboard. It too doesn’t need permissions and I find it more functional to use on a mobile. 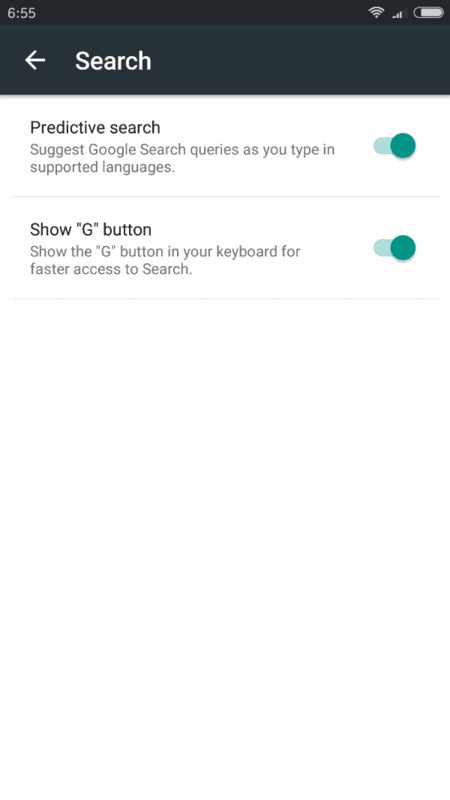 Gboard is much better than SwiftKey, faster and way easy to configure settings, and settings have much more options to turn off, if you want have secure / fast Gboard, you can turn off almost every setting. Gboard also use 5-10% less RAM than SwiftKey, and when most of options are turned off it save up battery greatly too. I actually use MessagEase, which is excellent, but needs some practice to get used to it… I don’t regret the time I spent on learning it. I want to keep Gboard working because sometime people have to type on my phone and they must switch on this one…. I didn’t even know GBoard existed until I noticed huge data charges being incurred. I looked up data usage in my phone and found that GBoard was using more of my data than even I was using for my own purposes! Basically, I was paying money to allow Google to spy on me. I completely uninstalled the app, problem solved.